Is your dog constantly licking and scratching? If so, you’re not alone. Many dogs lick and scratch as result of itching (also called pruritis). The itching may be minimal or extreme, and can even cause injury. Itching is a characteristic of many possible skin conditions and, treating an itch effectively requires determining the underlying cause. This is not a road you want to go down alone. 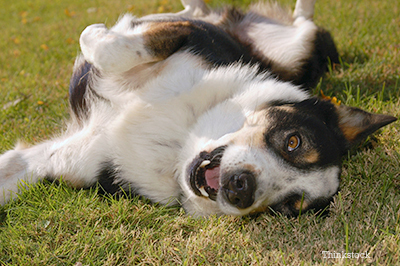 Finding the cause of an itch requires testing, and help from your veterinarian. What might make my dog itchy? It is important to remember that itching is not a disease, or a cause of disease, but rather the result of a disease process. Effectively treating itching requires treating its cause. If your dog is frequently itchy, you may first suspect a problem with fleas. It’s a common assumption, but fleas are far from the only cause of skin irritations and itches. That said, your dog should absolutely be on year-round flea and tick preventative. Some diseases only start to itch when a dog develops secondary bacterial or yeast infections. Whatever the cause, it’s understandable that intense itching is a serious source of distress for your dog. All may result in a cascade of inflammatory chemicals from cells in the skin. A dog may show allergic signs like itching when his immune systems begins to recognize everyday substances (allergens) as dangerous. Allergic conditions will also be considered by your veterinarian and efforts made to identify the causative agent, as well as attempt to block the allergic reactions. Atopic or allergic dermatitis is associated with inhaled or even topical materials that enter the body and trigger an excessive release of inflammatory secretions that result in itch. Interpreting allergy tests requires experience and you may even need a specialist. There are recent developments in the treatment of allergies and allergic reaction. Ask your veterinarian what can be done. What have you seen and when did you first see it? Are other pets affected? Are you? Next is a thorough physical examination, focusing on— but not limited to— the skin. Parasites and infectious conditions should be considered. They are relatively common, and generally respond to appropriate treatments very well. They may or may not be the main cause of itching. Dry skin can also cause itching, but it is almost never the only reason your dog itches. A thorough physical exam by your veterinarian can help uncover the underlying cause of your dog's discomfort. Because some metabolic and systemic illnesses can cause itching, blood tests may be advised to evaluate the health of organ systems other than the skin. One important thing to remember is that while you may be annoyed by your dog’s itch, they are genuinely suffering and need to be diagnosed and treated without delay.